My recent trip to Devils Lake, North Dakota gave me some excellent insight into one of this year’s hottest ice fishing topics. High end flashers and fish finders have been the topic of numerous questions in all of the Facebook ice fishing groups and online fishing forums. Having no brand affiliation I have always wanted to do an unbiased review of the top end ice fishing fishfinders available currently. 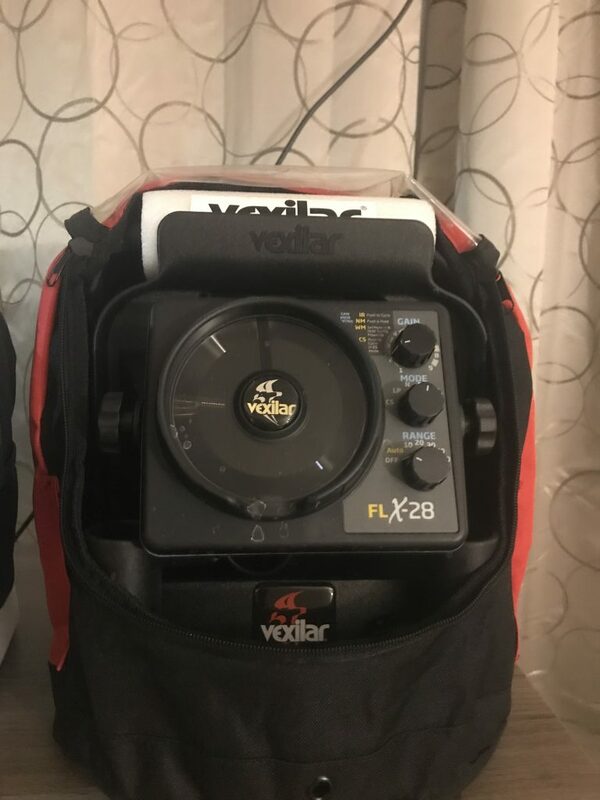 During the trip, I was able to use a Vexilar Flx-28 and a Humminbird Helix 7 gen2 along with my Marcum Lx-7. We experienced bitter cold with actual air temperature at -20 F along with stiff winds, rough driving, high sun, late nights fishing in the shack, fishing over 37’ deep and shallow water walleyes less than 5’. The diverse conditions and ability to fish with all three top end fish finders gave me some clear insight on these machines. For a little bit of background, I have done this trip to the heart of jumbo perch country several times. I knew from reports on devilslakefishingreport.com that like past trips the perch were going to be mainly congregated in 35’ of water or more. Last year when fishing 36-38’ of water with a mid-price range flasher, I found it was very difficult to see multiple lines or tell if a fish was lying on the bottom. When our guide offered his Flx-28, it was a complete game changer. Now I’m not saying you can’t catch a perch on Devils Lake without an expensive flasher or any flasher at all, but it will be much more difficult. Jigging right on the bottom or in the middle of a school results in very few bites and jigging too high before a school is fired up seemed to be a pretty good waste of time as well. A good flasher will maximize the number of bite opportunities you’re going to get. I’d like to talk about the machines we used, what we liked and loved, and what could be better. 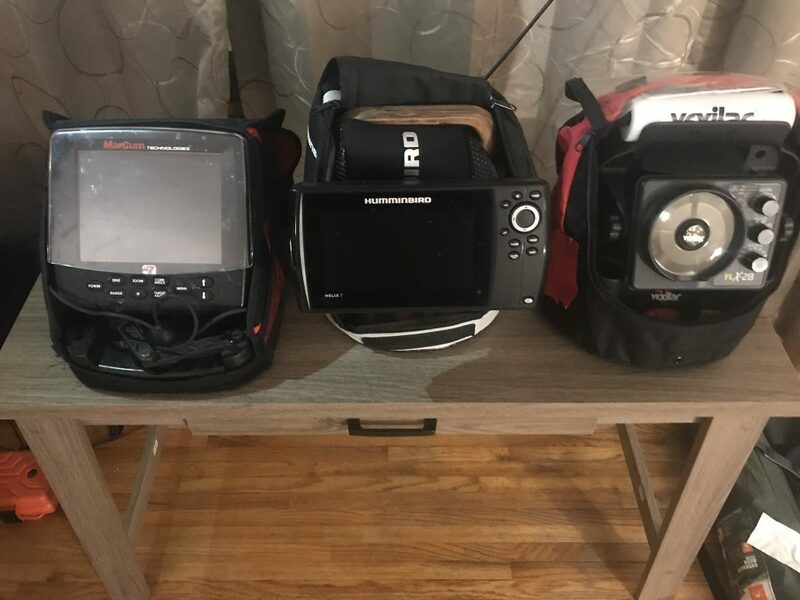 The Marcum, Humminbird and Vexilar units are all in the same price range at retail ranging from $679-$750 depending on the store and model. The Vexilar Flx-28 is a new take on an old unit. Offering familiarity, simplicity, and extreme durability is the claim to fame from this legacy company. 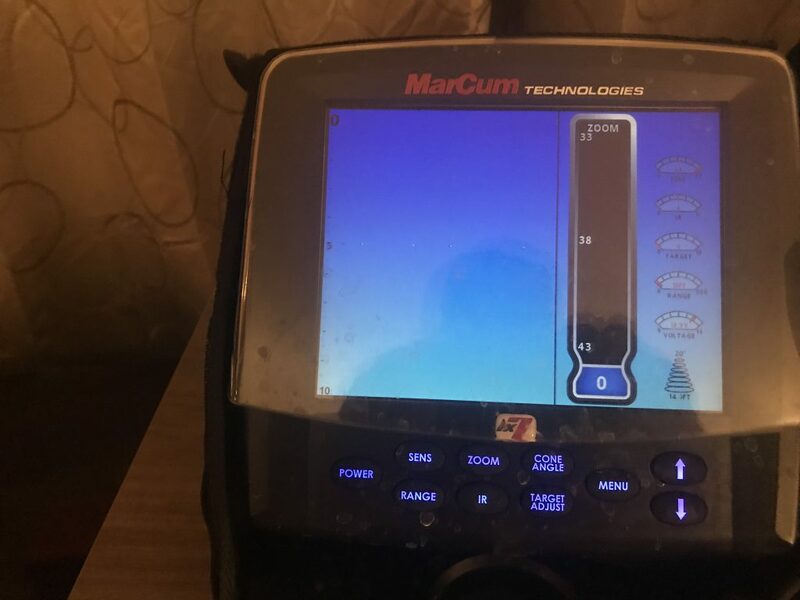 The Marcum Lx-7 on the other hand is completely new technology. It offers numerous screen display options ranging from standard flasher mode with and without zoom to an instant read scrolling screen that we are used to seeing in the boat. I’ve had several questions about this LCD style technology and lagging. I can attest to the fact that no matter the depth the fish finder responds instantly to lure movement. The Helix 7 gen 2 is a new take on a boat sonar system that offers not only LCD style rolling screen or flasher options, but adds GPS technology as well. Looking at all 3 units side by side in the shack the first thing I noticed was how quick I was able to dial in the Vexilar unit. All I did was turn on the dial to AZ (auto zoom mode) and start fishing. The other two units took about a minute to find the screen I wanted and tune it for best readings. Once I dialed the Marcum in one time it was pretty much setup for the whole trip. The Hummingbird unit was changed often to accommodate GPS travel, but basic fishing screen settings remained the same. The next thing we noticed was the interference rejection systems. All three systems were able to fish in a single shack with minimal interference issues. The Vexilar was again fairly easy to use. Pushing the gain button a few times resulted in a clear screen. Marcum was also very easy to tune out interference with. Pushing the “IR” button and then the up button a couple times made for a clear screen as well. The Helix 7 took a quick YouTube search to find the settings to negate interference but eventually did clear its screen as well. Once the flashers were tuned and interference was eliminated, we compared overall sensitivity and target separation. Despite some difference in listed target separation (Vexilar ½” Marcum ½” and Hummingbird 1”) all three units picked up lures extremely well at 37’. All three units showed all five fishing lines separated well and marked very clearly overall. However the Humminbird unit definitely had a weaker signal. The Marcum and Vexilar units marked a small split shot strongly and separated from a minnow at depth. The Helix 7 showed the split shot most of the time but it wasn’t a strong mark and often it disappeared. The Marcum unit had by far the best separation and picture. My fishing partner and I found the red marks of the Vexilar to be big and blocky hiding detail at times. The Marcum’s fine lines and multiple colors made it possible to fish between fish in a school, and determine the size of the perch. These fish clearly marked on the Vexilar but it was difficult or impossible to see between fish or tell difference in size while they were schooling. This often made a huge difference when deciding whether to grind on a school or move to the next hole. The Helix 7 had an intermediate line. It was easy to see fish even on bottom but like the Vexilar it was tough to tell fish size at times and it was difficult to see between them. Overall for this feature Humminbird had intermediate target separation but was closer to the Vexilar than the Marcum. Although Vexilar has a shallow water setting for the shallow walleyes at night they had far fewer features. Also, the other units didn’t have to be changed at all to handle shallow water. We used the GPS feature on the Helix 7 constantly to follow contour lines, find safe trails, and plan our next moves. Regardless of your fish finder pick I would highly recommend a similar GPS unit in your truck or on your machine. It makes it so much more efficient to have your location on a map when you’re moving that it’s worth the purchase in my opinion. A feature that surprised me on the Helix and Marcum units was the history portion of the scrolling view. Multiple times I was surprised by a bite when I wasn’t paying much attention to my rod or graph. I could quick look back and see exactly what I did to make that fish bite. After this type of bite happened two or three times I was able to develop a pattern. When a fish came up to my bait I needed to jig through the bite. If I slowed down or stopped I wouldn’t get a bite. This feature really shortened the learning curve. I’ve seen how the history on an LCD unit showed fast moving trout before as well. You barely see anything on a flasher when a nice trout swims past but if you can see it and react it gives you a shot at the fish. The Vexilar unit would certainly mark the perch but without history you had to notice exactly what made a fish bite. Day two of our trip had us hole hopping and making small moves. After morning fog burned off we had full sun all day and got the chance to see how well these units preformed. All three units worked well in sunlight. The Flx-28 was the best overall in this category. The bright LEDs were visible in direct noon sunlight and no changes needed to be made. They weren’t super bright in this scenario but certainly adequate. The Lx-7 worked well but needed the backlight turned up almost all the way to be able to see the screen. I also tried to shade the screen as well as possible during this time. The Helix 7 worked at a low backlight level but during the brightest conditions we did turn the backlight from the 3-4 range up to 6. Battery life on the Vexilar was never an issue when fishing from 7 am to 6 pm there was never a sign of slowing down and we never turned the gain up. Similarily the Marcum unit went strong all day. If it was starting to weaken at the end of the day it wasn’t even enough to turn up the sensitivity. We charged the Vexilar and Marum units every night just in case though. From the research we had done Helix units have a large amp draw (approx. .7 amps/hr) so we planned ahead and used a large lithium battery (20 amp). We never charged this battery and it was still humming on the third day. If we had used a standard lead acid 10 amp battery it is likely the power would have been low 5-6 hours into day 1. I do recommend a lithium battery such as the ones made by Dakota Lithium the Helix units. All three units stood up to brutal cold North Dakota conditions. They bounced through drifts in the back of a truck. Transducers were dropped on ice and into holes and all the units worked well. However, as a personal note, I have had one Marcum transducer break in the past and my 8 degree transducer seemed to be acting weird on the Lx-7 unit. I have never seen or heard an issue with the other two units. During our trip though there were zero problems or complaints. Overall all three units out preformed the mid range physical flashers that I have used in the past. Any one of these units would be more than adequate to successfully fish perch at these depths. 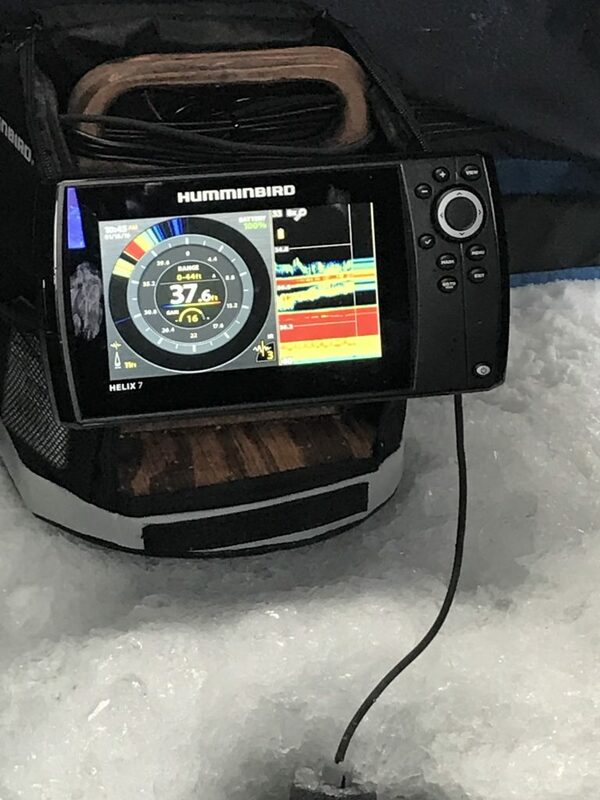 I think if you were regularly targeting fish in more than 50’ of water the Humminbird unit would struggle at some depth but the other two would be fine. I didn’t expect the Helix to have the target separation and power to pick up multiple fishing lines the way it did either. The GPS feature is huge and I will certainly be using it more in the future. I thought I would like the Flx-28 more than I did and I was surprised how annoying flasher view became after an hour with a scrolling LCD view and zoom. Neither of us used a flasher mode on anything after day one for this reason. Heres a chart to help you see how we graded the features of each machine. The average ice fisherman could benefit the most from owning the Helix 7 gen 2 unit. Although it grades out below other units its versatility does make it a great all around unit. It was very easy to see and the features were great. What it lacked in sensitivity wasn’t an issue at all in 37’ of water. The GPS with tracks and waypoints is absolutely essential on big water and cuts time in half when looking for old spots or the track off the lake in the dark. The ability to adapt this fish finder to the boat also makes it more affordable as an all year round system. These are all huge reasons to look into the Helix. The serious ice angler has to try out a Marcum Lx-7 this was an ice fishing machine. Regardless of lure size I could see it clearly and the detail of the fish size was incredible. If Marcum could add a GPS system at this price point with mapping it would be an unbeatable combo. As a fisherman who enjoys learning how to tune a unit and always has a backup this is my personal number one pick. Finally for guides and newer anglers who want to buy a great unit the Flx-28 is an awesome unit. It was incredibly easy to setup. It does everything you need, and you never need to worry about it failing. If anything ever does happen they have a customer service department that blew me away. I called to buy a replacement part on a second hand fl-12 unit that was around 6 years old. They immediately asked for my address and sent a replacement free knowing I wasn’t the original owner and it was an old unit. Now that’s good service! No matter what unit you choose you wont be disappointed. They all work great overall and show you exactly what the fish are doing. The only recommendation we have is that a GPS unit that can be mounted in truck or on a machine is absolutely a game changer. There are many excellent brands of these. Next post: BeaverTail and Steelhead?